Although I have oily skin on my face, there are parts of my body that are always feeling sore and dry. Like my legs and feet…especially my feet (not a pretty sight!). They are in much need of some TLC. I have been using the new Burt’s Bees Naturally Nourishing Milk & Honey Body Lotion for awhile now and it has been doing an excellent job in making my skin look and feel hydrated and healthy. 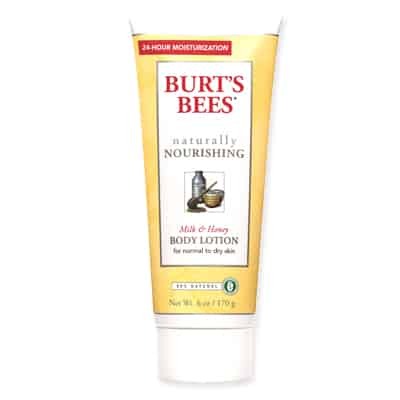 Burt’s Bees Naturally Nourishing Milk & Honey Body Lotion contains milk (softens the skin) and honey (nourishes the skin) as well as botanical moisturizers including coconut oil, grape see oil and sunflower oil. The fragrance is 100% natural with its notes of honey, vanilla, lemon and mint- a combination that smells wonderful together! It’s great for normal to dry skin and has been clinically proven to moisturize for 24 hours. I have been using the lotion on my legs after shaving and love how it soothes my skin. It took away the dry patches I had on my legs and left them feeling soft and supple. The biggest effect though was on my feet. My heels were so dry and cracked and in dire need of some hydration. I applied the cream on my feet and it has softened up my heels and has helped a great deal. I have even been applying the lotion to John’s feet. His feet have also greatly improved. It’s not greasy at all and our skin just drinks it up. As I expected, this is another fabulous product from Burt’s Bees that works wonders for my skin! I voted for your blog at Picket Fences today. I voted today on Picket Fence Blogs.